So in school, I was a bit of a jock. Yes, I did cheerleading, but over the years I also played softball, soccer, tennis, ran track and cross country and did a small amount of time with the swimming team. I loved sports. So when my daughter was born, I had visions of her in her shin guards, scoring goals at 4 years old. Over the next few years I even picked up a pair or two of cleats at various consignment sales sure that one day she would need them. Then she turned 3. It was time! Time to start looking for things to enroll her in! Yippie! However, the only thing she ever seemed to talk about was princesses and ballerinas. Seriously, a girly girl. No problem. I too was a girly girl who could also kick a soccer ball and swing a tennis racket. She would of course do the same. No dice. Even with my pushing, er, I mean encouragement, she was addiment that she wanted to be a ballerina. The final straw came when I picked her up from daycare one day and ran into her best friend all dressed in a tutu on her way to dance. My battle was over. "Mom! Jayden is a ballerina! I want to go to dance class!". 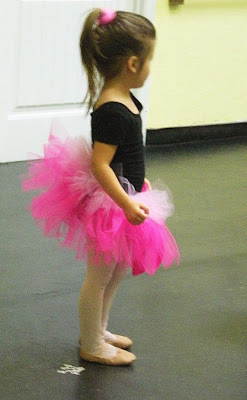 She realized that there actually was a place to go to be a ballerina. 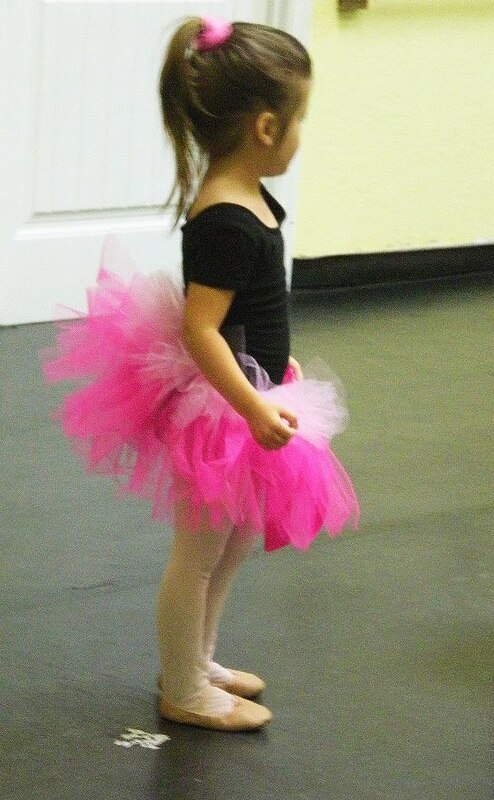 Thus, my child does ballet every Thursday and loves every second of it. Because I had zero experience in anything dance, I didn't know what to expect. Luckily, several cousins and close friends knew what I needed and got me on the right track... tights, ballet shoes, leotard, etc. Check. We arrived the first day, and she jumped right in. Smiled the whole time. I took a million pictures. I went to my trusty craft blogs and found it here. Perfect. I even had all of the supplies on hand and bought nothing for this project. The pink fabric is a curtain from the Walmart dorm room section I got on clearance for $4! I bought this for another project and have tons left over still. The lining is another Walmart special I got in the remnant stack for a couple bucks also for another project. And the applique is left overs from a skirt I made, a scrap of felt, and a random button. (I went applique style since I didn't have any fabric paint) It came out awesome and I have plans to make a larger version beach bag for myself. You now know the story of the ballet bag... isn't mommy guilt harsh? What a lovely bag! I love your applique, too.